Ingushetia-Chechnya border agreement is constitutional - Russian Constitutional Court | Russian Legal Information Agency (RAPSI). ST. PETERSBURG, December 6 (RAPSI, Mikhail Telekhov) – Russia’s Constitutional Court has held that an agreement on the administrative border between two North Caucasus republics Ingushetia and Chechnya complies with the country’s Constitution, RAPSI reports Tuesday from the court. 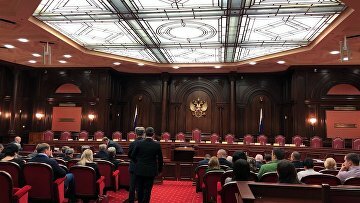 The Constitutional Court of Russia heard the application of Yevkurov seeking to review the agreement for its compliance with the country’s Constitution on November 27. Yevkurov also asked the court to examine actions of the Ingushetia Republic’s Constitutional Court declaring the agreement unconstitutional. The matter was examined on a fast-track basis upon a request of Ingushetia’s head Yunus-bek Yevkurov. During the hearings in court, the Federation Council member Andrey Klishas said that the Ingushetia Republic’s court exceeded its authority as it was considering the agreement that had taken effect. However, in accordance with the republican law, it could hear only non-operational documents. The agreement was signed by the head of Chechnya Ramzan Kadyrov and the head of Ingushetia Yunus-bek Yevkurov on September 26. Later, on October 4, parliaments of two republics passed the regional laws enforcing this agreement. The document became effective in mid-October. According to the agreement, a new border would facilitate further integration of regional economies and improve economic and social cooperation.